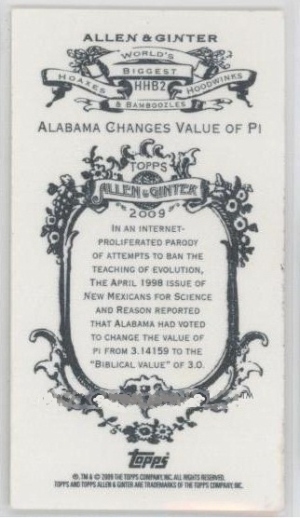 Read the Original "Alabama Pi"! 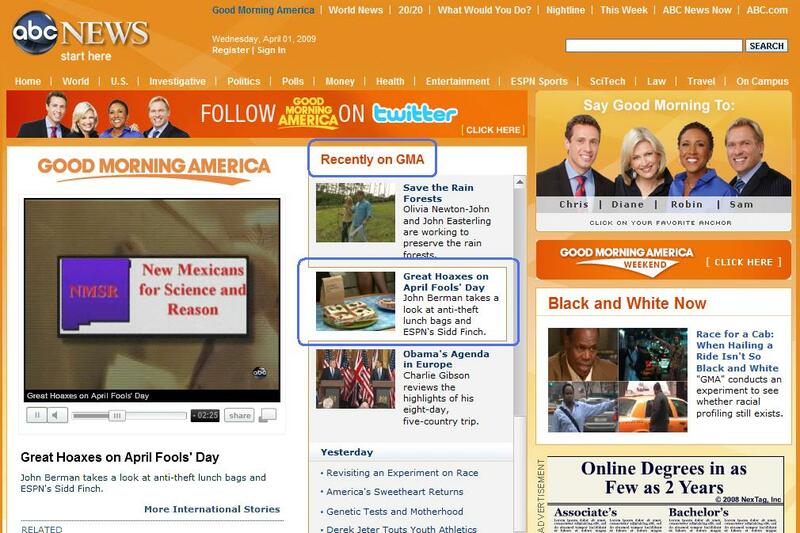 As Seen on ABC's "Good Morning America"! HUNTSVILLE, Ala. -- NASA engineers and mathematicians in this high-tech city are stunned and infuriated after the Alabama state legislature narrowly passed a law yesterday [March 30, 1998] redefining pi, a mathematical constant used in the aerospace industry. 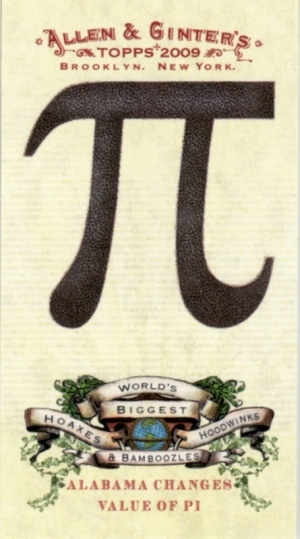 The bill to change the value of pi to exactly three was introduced without fanfare by Leonard Lee Lawson (R, Crossville), and rapidly gained support after a letter-writing campaign by members of the Solomon Society, a traditional values group. Governor Guy Hunt says he will sign it into law on Wednesday. The law took the state's engineering community by surprise. "It would have been nice if they had consulted with someone who actually uses pi," said Marshall Bergman, a manager at the Ballistic Missile Defense Organization. According to Bergman, pi (p) is a Greek letter that signifies the ratio of the circumference of a circle to its diameter. It is often used by engineers to calculate missile trajectories. Prof. Kim Johanson, a mathematician from University of Alabama, said that pi is a universal constant, and cannot arbitrarily be changed by lawmakers. Johanson explained that pi is an irrational number, which means that it has an infinite number of digits after the decimal point and can never be known exactly. Nevertheless, she said, pi is precisely defined by mathematics to be "3.14159, plus as many more digits as you have time to calculate". "I think that it is the mathematicians that are being irrational, and it is time for them to admit it," said Lawson. "The Bible very clearly says in I Kings 7:23 that the altar font of Solomon's Temple was ten cubits across and thirty cubits in diameter, and that it was round in compass." Lawson called into question the usefulness of any number that cannot be calculated exactly, and suggested that never knowing the exact answer could harm students' self-esteem. "We need to return to some absolutes in our society," he said, "the Bible does not say that the font was thirty-something cubits. Plain reading says thirty cubits. Period." Science supports Lawson, explains Russell Humbleys, a propulsion technician at the Marshall Spaceflight Center who testified in support of the bill before the legislature in Montgomery on Monday. "Pi is merely an artifact of Euclidean geometry." Humbleys is working on a theory which he says will prove that pi is determined by the geometry of three-dimensional space, which is assumed by physicists to be "isotropic", or the same in all directions. "There are other geometries, and pi is different in every one of them," says Humbleys. Scientists have arbitrarily assumed that space is Euclidean, he says. He points out that a circle drawn on a spherical surface has a different value for the ratio of circumference to diameter. "Anyone with a compass, flexible ruler, and globe can see for themselves," suggests Humbleys, "its not exactly rocket science." Roger Learned, a Solomon Society member who was in Montgomery to support the bill, agrees. He said that pi is nothing more than an assumption by the mathematicians and engineers who were there to argue against the bill. "These nabobs waltzed into the capital with an arrogance that was breathtaking," Learned said. "Their prefatorial deficit resulted in a polemical stance at absolute contraposition to the legislature's puissance." Some education experts believe that the legislation will affect the way math is taught to Alabama's children. One member of the state school board, Lily Ponja, is anxious to get the new value of pi into the state's math textbooks, but thinks that the old value should be retained as an alternative. She said, "As far as I am concerned, the value of pi is only a theory, and we should be open to all interpretations." She looks forward to students having the freedom to decide for themselves what value pi should have. Robert S. Dietz, a professor at Arizona State University who has followed the controversy, wrote that this is not the first time a state legislature has attempted to redefine the value of pi. A legislator in the state of Indiana unsuccessfully attempted to have that state set the value of pi to three. According to Dietz, the lawmaker was exasperated by the calculations of a mathematician who carried pi to four hundred decimal places and still could not achieve a rational number. Many experts are warning that this is just the beginning of a national battle over pi between traditional values supporters and the technical elite. Solomon Society member Lawson agrees. "We just want to return pi to its traditional value," he said, "which, according to the Bible, is three." Note: Correspondent April Holiday is not related to "Wonder Why" columnist April Holladay. Pi are not squared...Pi was a hoax! Our little "Alabama Legislature mandates pi=3" April Fool's story (NMSR Reports, April 1998, May 1998) is still going strong! On April 1st, I posted an April Fools news story by Mark Boslough on talk.origins. But, as the story was forwarded from person to person, all of our deliberate hoax hints were deleted. The article has since traveled across the globe. I plastered last month's confession/explanation all over the 'Net -- a dozen newsgroups in all. But, due to a poor choice of title, it appears to have simply gotten lost in the wild and woolly Weird World Web. I named the post "NM Physicists create artificial life on the Web." I could have re-posted under a better title (such as "WE WROTE ALABAMA PI!!! "), but why spoil the fun? Anyone tracking the source by searching for "Alabama pi" will see the "NM Physicists..." articles, and can learn the facts for themselves. Anyway, the new urban legend lives on, and is propagating to new groups like alt.conspiracy and alt.callahans (the latter named after Spider Robinson's classic "Callahan's Crosstime Saloon" series). A mutated version worked its way back to us on May 27th, 1998, via a UNM physics professor. This version has undergone several mutations, and some of these appear to be adaptations for survival. Governor Guy Hunt was mutated into Governor Fob James (the current Alabama governor); Prof. Kim Johanson, a mathematician from University of Alabama, was mutated into Prof. Homer Carlisle; and state school board member Lily Ponja evolved into Judy Aull. On July 12, 2002, Prof. Homer Carlisle (the real Prof. Homer Carlisle, an associate professor at Auburn University in the department of Computer Science and Software Engineering) and Judy Aull (the real Judy Aull, an undergraduate student advisor in this department) e-mailed me, Dave Thomas, and informed me that the students who "mutated" the Alabama Pi legend were probably from their own department at Auburn University, which happens to be in Alabama. Thanks to the internet, we now know some of the precise memetic mechanisms involved in the evolution of this prank. The following two pieces show how the irrepressible Pi prank has been mentioned by the AP, and by German news. Ladies and gentlemen...we have a new Urban Legend. Rest Easy! Pi Is Not Changing! HUNTSVILLE, Ala. (AP) -- Did the Alabama Legislature really pass a bill to redefine the mathematical value of pi, changing it from 3.14 to 3? If you believe what you read on the Internet, it did. A seriously written story making the rounds through cyberspace describes how NASA engineers in Huntsville are upset about the proposed change, as are college professors. But Alabama students need not quit using 3.14 when finding the area of a circle. Pi isn't changing in Alabama. But it has been relayed by Internet users all over the country. It ended up on a Huntsville radio station and prompted calls to The Huntsville Times. Brian Hanson, data systems manager for the Legislature, said he received a call Wednesday from a Chicago radio station inquiring about the legislation. He said he had no idea how the story originated. The first giveaway that the story is a hoax is that it says Gov. Guy Hunt plans to sign the legislation. He hasn't been governor since 1993. And the purported sponsor of the legislation, Rep. Leonard Lee Lawson, R-Crossville, doesn't exist. The story also includes criticism from University of Alabama professor Kim Johanson about the Legislature trying to change a mathematical constant. Math professors at Alabama say they've never heard of Johanson, but they've heard plenty about the Internet story. "We had a good time with it," said professor Martyn Dickson, who said the math department received the story from someone at Purdue University. Katie Clark of the Purdue Life Sciences Library said she received the story from science librarian Richard Funkhouser, who read it on a Yale University posting, which had received the story from a Hawaii address. "No, I didn't write it," said Liz Bryson, an official with the Canada-France-Hawaii Telescope Organization in Honolulu. "We've had a lot of fun with it, though." She said she'd heard the story was an April Fool's joke-one that apparently wouldn't die. Funkhouser noted that the Indiana House of Representatives once tried to legislate the value of pi, but the Senate let the bill die after Purdue math professor C.A. Waldo explained the idiocy of putting pi into Indiana law. Muenchen (PC-WELT) - Dank des Internets leben Aprilscherze laenger als ueblich. Seit Wochen geistert die Nachricht durch die elektronischen Medien, der Staat Alabama wolle den Wert der Zahl Pi gesetzlich auf 3 festlegen, statt des "exakten" Wertes von 3,1415926535... Der Text enthaelt Stellungnahmen von NASA-Ingenieuren und Professoren und wirkt so echt, dass sogar Zeitungen und Radiosender sich bereits in Alabama nach den Einzelheiten erkundigt haben. Woher die Nachricht stammt, weiss niemand. Richard Funkhouser, Bibliothekar an der Yale- Universitaet, weist darauf hin, dass es tatsaechlich einmal den Versuch gegeben habe, den Wert von Pi gesetzlich festzulegen: in Indiana, im Jahr 1897. Thanks to the wonders of the Internet (http://babelfish.altavista.digital.com), John Fleck has offered the following crude translation. Be sure to check out the rudimentary but informative translation capabilities of Babelfish! As a general rule, I've learned that most people don't like the same books and movies that I do, so I hesitate to make recommendations because the odds are against me. Here's a different type of recommendation; check out from your local library one of the two recent books by William Dunham, The Mathematical Universe and Journey Through Genius, then decide if maybe you'd like to own one of them for occasional browsing. I find them very entertaining books consisting of short essays about mathematical proofs and personalities, but not the sort of book I want to read straight through. In The Mathematical Universe, which consists of 26 essays, A through Z, the third essay, "Circle" includes a story similar to the April Fool story in NMSR Reports, but a little more serious. In 1897, the following bill was passed by the Indiana House of Representatives and then by the Senate Committee on Temperance; "Be it enacted by the General Assembly of the state of Indiana, That it has been found that a circular area is equal to the square on a line equal to the quadrant of the circumference." This means that if you construct a square with each side equal to one fourth of a circle's circumference, the square and circle will have equal areas, which can be true only if pi equals 4! The bill was derailed mostly through the efforts of Purdue mathematician C. A. Waldo, who declined an offer to meet with the bill's author, saying that he was acquainted with as many crazy people as he cared to know! Talk Origins Post of the Month, May 1998.